Wooo! San Diego Comic-con is upon us. As usual, you'll be able to find me at the Topatoco booth, where they will be peddling all kinds of sweet Sam and Fuzzy paraphernalia. If you are going to be at the show, you are required by law to swing by and say hello. YOU HAVE BEEN WARNED. It's also a momentous week here on the site, where we are running the final three instalments of the Buddocalypse chapter -- and by extension, the Sam and Fuzzy Under the Influence volume as a whole. It is going to be pretty intense! After that, we'll take a brief break for our annual Obligatory Guest Artist Webcomic Duration (O-GAWD) while I gear up for the next volume. It is an exciting time to be alive and have the internet, friends. 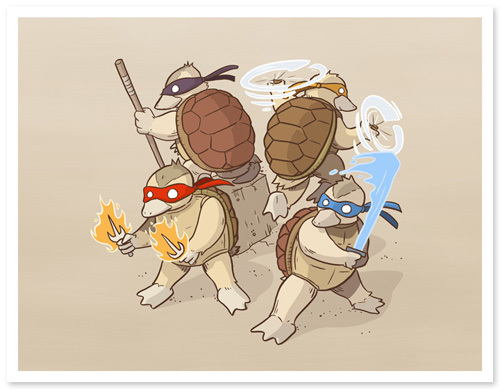 Ever since I started watching Legend of Korra and observing it's many various random mish-mash animals, all I’ve wanted to do is draw Teenage Mutant Bender Turtleducks. So I did! Sudden, rapid cell reproduction and growth triggered by evil, haunted wine. Obviously. Nothing I have written has ever been more thoughtful or impervious to criticism. Great question! The bundle of evidence that reporter Smith (and now presumably Morris as well) shows Sam's various ninja employees involved in local crimes. It does not show Sam directly involving himself in those crimes... which makes sense, because as we know, he wasn't involved and the whole thing was happening behind his back. So while Morris is certainly now thinks that Sam is secretly a crook and is very irritated about it, she doesn't have the evidence to prove it and is bringing him in -- or was planning to bring him in, anyway -- strictly for his involvement in the Fig Pig incident. Much, much weirder than that. See you next week, team! 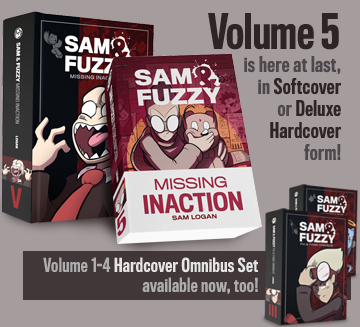 We are rapidly coming to the close of our current volume, Sam and Fuzzy Under the Influence! I hope you guys are as excited about the next volume as I am. As you can probably imagine, it's going to be... pretty different from the ones that have come before it. 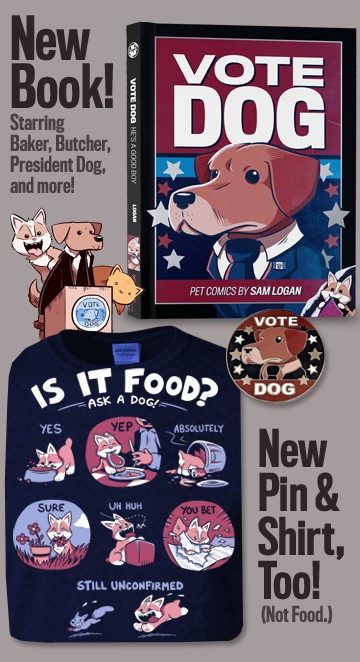 Sam and Fuzzy is a comic that's become infamous for it's major status quo upheavals, and this one will be no exception. But, we've got four strips left to go before Under the Influence wraps! Come back on Friday for the next one, plus a brand new round of Q and A.